Beach itself offering its splendid coast of gold to dark sand and gorgeous sunsets. However, the coast has over the recent years become popular with resident expats and now has a refined feel to it. Here you’ll find a fashionable almost chic scene, with rows of designer boutiques along its main roads and side streets; a handful of the island’s best dining venues, and world-renowned nightlife and entertainment spots that host international gigs. Seminyak nowadays is also home to some of the most chic resorts and villas on the island, and they in turn are surrounded by many luxury spas and dining outlets. The fine selection of lavish beachfront hotels started with the Oberoi, built during the hippie-and-surf craze of the seventies, and went on to become a landmark, lending its name to the whole north-western end of Seminyak and the road that runs through it (now officially ‘Jalan Laksmana’). Clearly not for backpackers and budget travellers, Seminyak now has quite an extravagant mix of luxury stays with the likes of The Samaya, Semara Resort & Spa, Anantara Seminyak, the ultramodern W Retreat & Spa, and a collection of five-star villas added to the scene. The main Jalan Raya Seminyak extends north from Jalan Raya Legian, and ends at Jalan Raya Kerobokan and the westernmost end of Kuta’s Sunset Road. Jalan Raya Seminyak branches into three main streets: Jalan Dhyana Pura, Jalan Laksmana and Jalan Petitenget in its north. Each has its own characteristics and typical collection of venues. 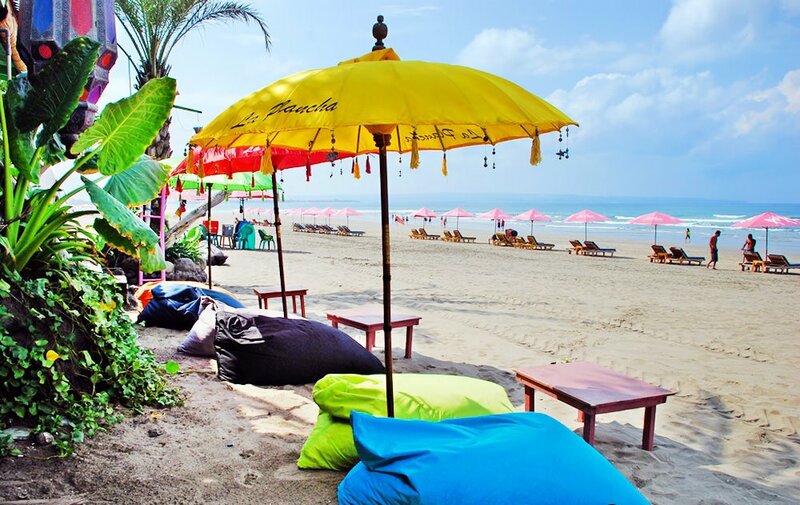 Jalan Dhyana Pura (also administratively referred to as Jalan Camplung Tanduk) features an eclectic row of bars; mostly a gay bar scene with go-go dancers, and leads down to the Anantara Resort that hugs the Seminyak beachfront. Jalan Laksmana has been fondly nicknamed ‘eat-street’ by expats for its concentration of great restaurants. Further south from here, Jalan Petitenget is home to most of the area’s notable establishments, such as Potato Head Beach Club and Ku De Ta. 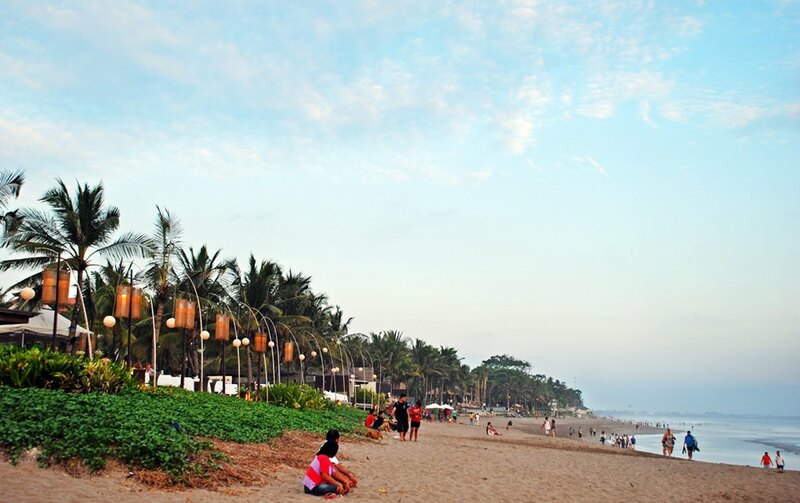 Seminyak Beach comprises three adjoining coastal strips, namely Pantai Arjuna or ‘Blue Ocean Beach’ that borders Legian, Petitenget Beach, and way up north to the quieter Batubelig Beach – home of the celebrated Mozaic Beach Club. As Kuta typically rocks on with its lively beach crowd and budget stays, and Legian with its eclectic bar and nightlife scene, Seminyak outshines the two as the island’s most prized beach resort area. Undercurrents are usually strong, and surfing is mostly for the advanced. 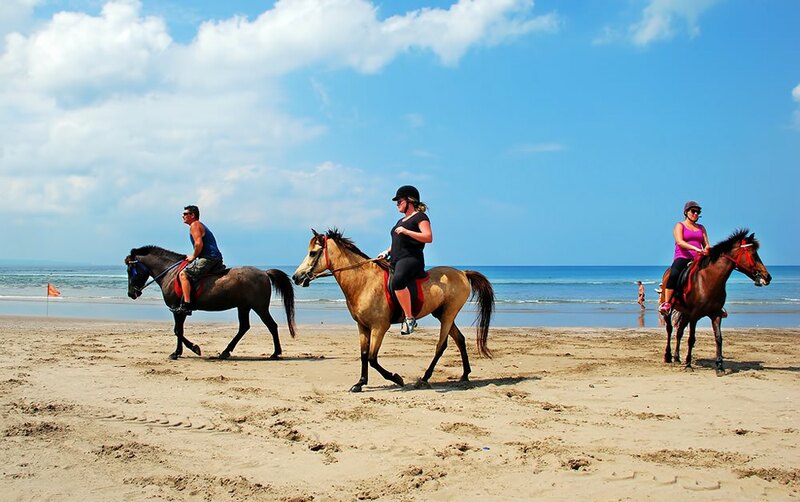 Other activities to be enjoyed along the coast include horseback riding that starts from the Umalas stables in Canggu in the north, down to Seminyak’s Petitenget coast and Legian’s Blue Ocean Beach area. Seminyak sunsets are not to be missed, best enjoyed while chilling out with friends around the chic poolsides of WooBar at the W Retreat, or down on the beachfront lawn of Ku De Ta or the Potato Head Beach Club.